Home > National Drugs Strategy (interim) 2009-2016. Ireland. Department of Community, Rural and Gaeltacht Affairs. (2009) National Drugs Strategy (interim) 2009-2016. Dublin: Department of Community, Rural and Gaeltacht Affairs. 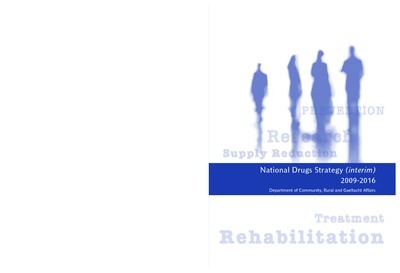 In late 2007, a review of the National Drugs Strategy 2001–2008 got underway. The overall objective of the review was to examine the progress and impact made under the current Strategy and to make recommendations for the period 2009–2016, which the new Strategy will cover. A Steering Group, chaired by the Department of Community, Rural and Gaeltacht Affairs, managed and oversaw the process. An extensive consultation process was undertaken as part of the review to give individuals and groups an opportunity to outline their views on the effectiveness of the current policy and what the priorities for the new Strategy should be. An overview of the issues raised under the different areas – which the Steering Group had regard to in their deliberations - is outlined in the various chapters.